Memory foam mattresses are a popular option due to their comfort and support. If you are thinking about getting a new mattress, there are a few things you should know about how to compare your different options and find the best memory foam mattress. We chose products made by manufacturers who have a good reputation and who are transparent about the materials used. Foam quality. We looked at the quality and density of the foam used to choose mattresses that provide support and comfort while remaining breathable. We included mattresses with different thickness levels so you could find the right option for your needs. Pressure relief. Memory foam mattresses can relieve pressure. We looked at how well mattresses relieve pressure points. We looked at reviews from shoppers to mattresses that felt comfortable and that were durable. We like this mattress because it is made from a BioFoam infused with green tea extract. Infusing the foam with green tea extract helps keep the mattress fresh and has a relaxing effect. We recommend the 10 or 12” models, but you can get thinner versions of this mattress. There are several sizes available, and the price range is very affordable. Zinus mattresses feature five layers. If you choose the 12-inch model, you will get a mattress with a 3-inch layer of memory foam, which is perfect for comfort and pressure relief. The 12-inch mattress has a 2-inch comfort foam layer, a 3.5-inch layer of high-density foam, and a 3.5-inch layer of high-density support foam. The comfort layer is designed to allow for optimal airflow to keep the mattress cool. This mattress has received the CeriPUR-US seal, which means it has been tested and found to be safe and environment-friendly. Cooling Gel-infused Foam Layer - to better regulate temperature. Breathable and washable outer cover. This is the best memory foam mattress for you if you are a hot sleeper. Traditional memory foam mattress can get too hot once they absorb heat from your body. This mattress features a top layer of memory foam that is infused with gel. Gel-infused memory foam stays cool even if you are a hot sleeper. Gel-infused memory foam is also perfect if you want a mattress that absorbs movements from your partner or pet. This mattress has a simple design. There is a thick layer of memory foam infused with a special gel designed to keep you cool and reduce pressure, and two base layers made from high-density foam to give you the support you need. 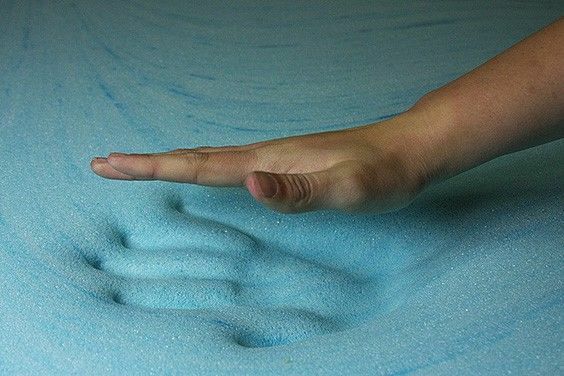 There is a layer of convoluted foam in between the high-density foam to make the mattress more durable. The mattress comes with an outer cover that you can remove and wash. The only downside of this mattress is that there are only three sizes available. This hybrid mattress is an interesting option if you want a comfortable mattress on a budget. This is also a great option for hot sleepers. This 12-inch mattress features gel-infused memory foam. This layer is two-inches thick and will adapt to your form. It will reduce pressure, and the gel will keep you cool. The mattress has a thin layer of transition foam and another layer made from individually wrapped coils. The coils are an interesting feature if you want a supportive and breathable mattress. They also help keep the price of the mattress down compared to foam mattresses. Note that the mattress has a plush feel thanks to the gel-infused memory foam. This isn’t an ideal choice if you want a supportive mattress that will keep your spine aligned, but this mattress is ideal if you want comfort and pressure relief. This is a 10-inch mattress with a CertiPUR-US certification. The mattress has two layers of foam. The top layer is 2.5” thick and made from memory foam. The base layer is 7.5” thick and is made from high-density foam. This is a medium mattress, but the cover is soft enough to create a plush feel. 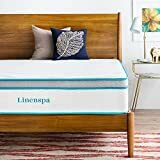 This mattress is ideal if you need the support of a medium mattress but are used to sleeping on a plush mattress and prefer this comforting feeling. This mattress is a great buy because of the quality of the memory foam. This is one of the best options available if you want a mattress that will relieve pressure. This mattress is an excellent choice if you are a side sleeper or if you suffer from back pain. 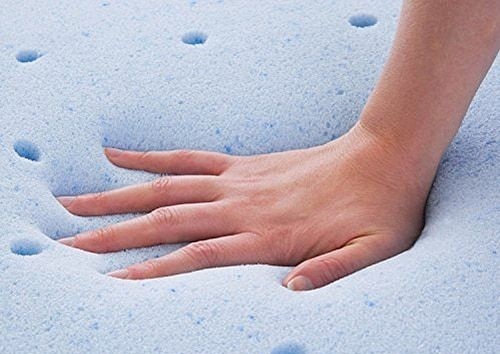 The main downside of this mattress is that it could have been more durable and supportive if the manufacturer had added a base layer of dense foam. This is still a good buy since you can get a Queen mattress for less than $300. This is a medium firm mattress with a layer of gel-infused memory foam. We recommend this mattress for hot sleepers and think this mattress is an excellent option if you need pressure relief on a budget. You can get a queen size mattress for less than $200. 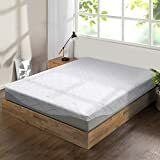 This mattress might not be as durable as other options, but we think this product is a good buy if you are shopping on a small budget and want a mattress that will provide you with support and pressure relief. You can choose from a 9 and an 11-inch model. These sizes aren’t common and can be an interesting choice if you want something more comfortable than an 8-inch or 10-inch mattress without spending a lot more. The cooling system of this mattress stands out. There is a 1.5-inch gel-infused memory foam layer on top of a 1.5-inch ventilated foam layer. The ventilated comfort foam is an interesting material because it keeps the mattress cool and creates a different feel from what you would typically get with a gel-infused memory foam mattress. The knitted cover softens the feel of the mattress. This is the best mattress for those who want comfort and a plush feel. 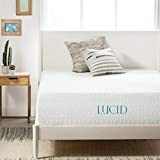 This Lucid mattress is more expensive than the other products we recommended, but it is well worth it. This mattress features a one-inch memory foam layer infused with bamboo and charcoal. This helps with temperature regulation and also keeps the mattress fresh. There is a three-inch layer of gel-infused memory foam to eliminate pressure. This layer has a ventilated structure to help keep you cool. The mattress will last for years thanks to its 10-inch high-density foam base. This is one of the best mattresses you can find if you want a product that will relieve pressure and provide you with a plush feel. A new mattress is an important purchase. 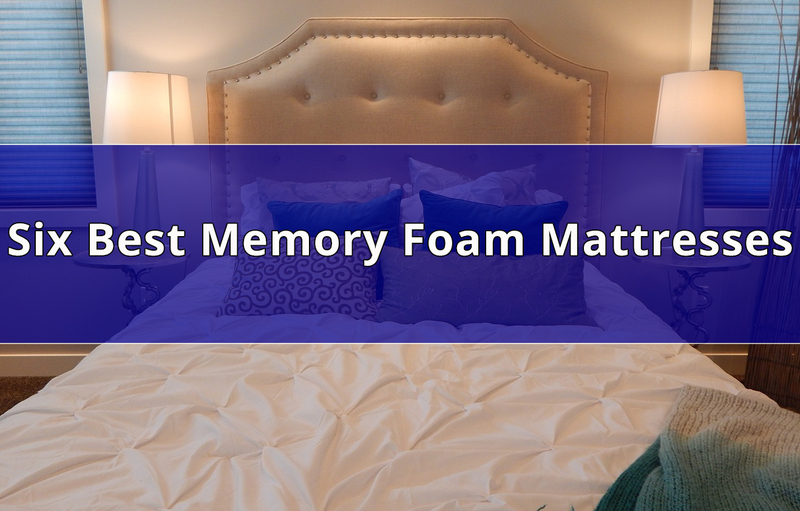 If you want to get a memory foam mattress, you need to find out more about the advantages of this material and about how to choose the best memory foam mattress. Memory foam is a popular material because it provides comfort and support. A quality memory foam mattress will last for years and will reduce pressure on joints and other pressure points when you sleep. Memory foam becomes more compact when exposed to pressure and heat. This creates a cradle that you can sleep comfortably in. Memory foam mattresses are typically made from several layers. Only the top layer is made from memory foam, and the other layers are made from high-density comfort foam. Hybrid mattresses sometimes have a coil layer for support. The downside of memory foam is that it absorbs heat. This can make this material uncomfortable for hot sleepers. Is A Memory Foam Mattress Right For You? Some people don’t like to sleep on a memory foam mattress because they get the feeling that they are sinking into the mattress. Others find this feeling comforting. It is best to go to a mattress store and try a memory foam mattress to see if this is a feeling you like. If you don’t like this feeling, you can still get the benefits of memory foam by choosing a mattress with a thin layer of memory foam on top of a high-density comfort foam layer to get more support and bounce. If you are a hot sleeper, memory foam might not be comfortable. You should look into getting a gel-infused mattress instead since gel-infused foam will keep you cool. 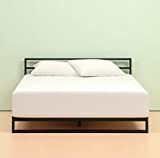 If you are looking for a mattress that relieves pressure because you sleep on your side or back, or suffers from back pain, a memory foam mattress would be an excellent choice. 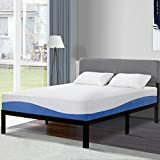 This material is perfect if you are looking for a mattress that will absorb movements, so you don’t feel your partner moving around during the night. Avoid mattresses that contain phthalates, formaldehyde, and other chemicals that could be harmful. Choose a hypoallergenic mattress if possible. Pay attention to the density of the mattress. High-density materials are more durable and provide more support. mmHG stands for millimeters of Mercury. This is a unit of pressure that will tell you how a mattress reacts when pressure is applied. A high mmHg rating means better pressure relief. A thick mattress will cost more but will be softer. If you are a side sleeper, look for a mattress that is between 10 and 14” thick to reduce pressure points. The support base is an important feature to look at. A coil support base will make the mattress more durable and absorb movements. Consider getting a mattress topper. If your new mattress is too soft, add a latex topper. You can soften your new mattress with a featherbed cover. The firmness of a mattress one of the most important features you should look at. If you sleep on your back, a medium or firm mattress will be best for you. If you are a side-sleeper, a soft or medium mattress will reduce pressure points and keep your spine aligned. If you tend to sleep on your stomach, a firm or medium mattress will feel most comfortable. If you tend to change sleeping positions throughout the night, look for a mattress that is between medium and firm. Go to a local mattress store to try different firmness levels and see what you like best. The density of a mattress will impact its price. High-density foam is more expensive, but it makes the mattress more durable. 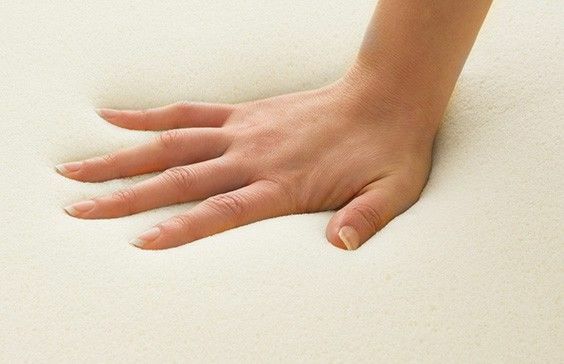 High-density foam is often used in the base layers of a mattress for comfort and support. High-density foam in the upper layers will make a mattress more durable. You can still get a soft feel with a low-density memory foam layer. The density of a mattress is measured in pounds per cubic feet. Density will vary from one layer to another, and you should pay attention to the density of the upper layer to determine how durable a mattress last. Foam with a density under 3.5 lbs/ft3 won’t last more than a few years. Try finding a mattress with upper foam layers that have a density above 5 lbs/ft3 for durability and additional support. You should have a better idea of what to look for when shopping for a memory foam mattress. Take a look at the mattresses we have recommended, or head to your local mattress store to try different products and find a mattress with the right feel.